Barcelona ace Sergi Roberto has revealed a little chat he had with Luis Suarez before this weekend’s El Clasico demolition of rivals Real Madrid. 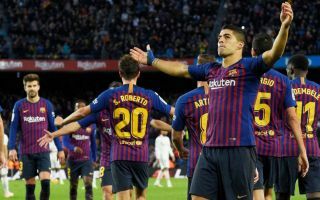 Suarez hit a hat-trick at the Nou Camp to help Barcelona to a thumping 5-1 victory that looks set to cost Real Madrid manager Julen Lopetegui his job, according to various sources today. Goal are among those stating Lopetegui’s time is up and that Antonio Conte could come in and replace him, which will only add to the feeling of satisfaction at Barcelona. Roberto admitted he wanted the game to go on longer as he apparently wasn’t the only one who felt the Catalans could have just kept on scoring against this shambolic Madrid defence. The Spaniard also revealed something interesting about his combination with Suarez during the game, and explained how the pair discussed it beforehand. Watching back previous Clasicos, the Uruguayan striker apparently told Roberto he didn’t set him up for enough goals anymore, so he promptly went and assisted two this weekend. ‘Before the game, we watched a video of previous fixtures against Madrid and we saw the assists I’d given Suarez in those matches,’ Roberto is quoted by ESPN. Barcelona fans will no doubt hope this deadly duo can continue to give each other good advice and combine again for the rest of the season.